Jarrett is used to his mother's tendency to take in any baby in need and foster him or her until a permanent home can be found. He doesn't like having to share her attention with the never-ending string of babies in the house but he has learned to deal with it. But things are much different when his mom agrees to take in Treasure and her 12 year old brother Kevon, who is now sharing Jarrett's bedroom. The two boys clash from the beginning and things really heat up when it turns out that Kevon is a great basketball player and attracts the attention of Caprice, the girl Jarrett likes. Jarrett starts telling people at school and the rec center some of Kevon's secrets and Kevon responds in kind. 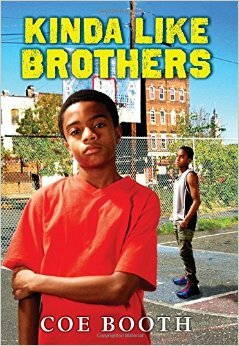 This is a great story of the two boys and their struggles to get along which really is just like brothers. The portrayal of both boys is good but I also liked Mom's boyfriend who is a very strong role model for all the boys in the neighborhood and a good partner for Jarrett's mom who needs someone understanding.